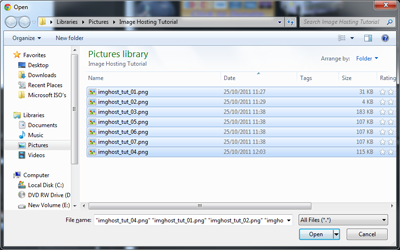 Overview: The following tutorial is a step by step guide on how to upload multiple images into your RnS Image Hosting account as well as how to insert them into posts. 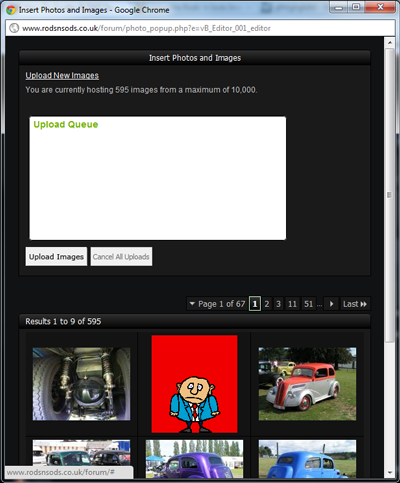 Rods 'n Sods Image Hosting is available to ALL registered users via the 'Image Hosting' button on the menu above. As per normal, find the thread you want to comment on or start up a new one. At the top of the message editor you'll see the toolbars containing the normal formatting buttons. In with the URL Linking group there is a small camera icon button. Click on the button to open the "Insert Image" popup window. In order to upload new images click the "Upload New Images" link in blue. This will show the image upload controls and queue. Click the "Upload Images" button to open the explorer dialog box. Browse through the folders to find the image(s) you want to upload. 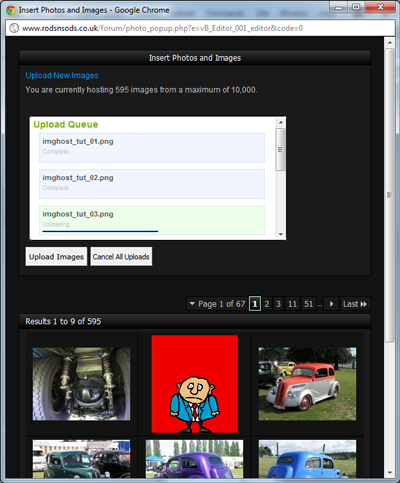 Multiple images can be selected by either hilighting the 1st file and then "Shift" + Click on the last one to select a group or "Ctrl" + Click to select files individually. Once you have selected all the images you want to upload click the "Open" button. Depending on what operating system you're using the file explorer dialog may look slightly different. You should now see the files being uploaded and their progress shown within the queue window. The time this takes will depend upon the native filesize of the images and your internet connection speed. Once all the files have uploaded the window will refresh, closing the upload controls area and showing your newly uploaded images in the grid below. The software is currently limited to a maximum of 20 images per upload queue. This may be changed in the future however the uploader can be run multiple times to add further images by repeating step 2. Images will be resampled and resized on the server to preserve space. That's it for the uploading part. 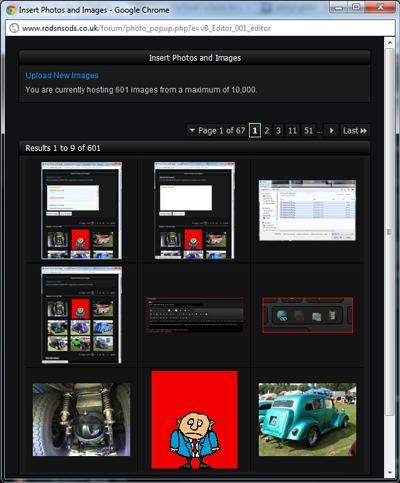 If the image browser is not currently open then it can be brought up by clicking the camera icon as detailed above. Images will be inserted at the current location of the cursor within the editor. You can flick between the windows to re-position the cursor if needed before inserting the image (by pressing "Alt + "Tab" in Windows). Using the grid display, locate the image(s) that you want to insert. 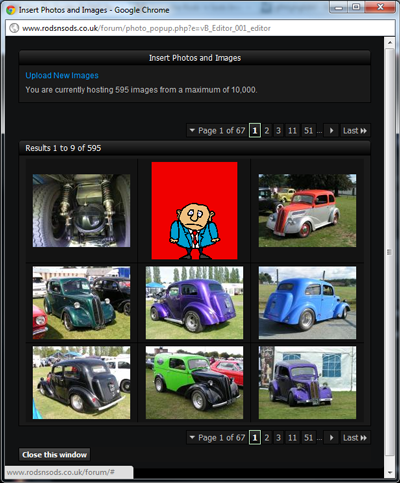 The pagination controls can be used to navigate through all of the images that you currently have stored on Rods 'n' Sods Image Hosting. To insert the image within the post simply click on the image. This will post the [IMG]...[/IMG] tags with the image url into the post for you along with a newline above and below. If you have finished adding images to the post then you can close the window or it will automagically close when the post is submitted. If you have or would like to do a tutorial for the Rods 'n Sods forum then please Contact Me.